This one caught my eye. I’ve got a thing for video, I guess. Not that I particularly like putting myself on video, but I love the potential for engagement with video responses, conversations and feedback. The interactivity and interplay with grids and video responses for feedback are enticing. So far I’ve just tinkered and played with using Flipgrid in a physical classroom, giving students a chance to explore and play in this ‘digital sandbox’ without expectations or directions. This past month, I had the opportunity to engage in a larger Flipgrid use event – MAD PD. This whole day’s worth of PD for educators was set up and shared as a Flipgrid. Each presenter was asked to share a Flipgrid video about their presentation – as a promo to their topic. 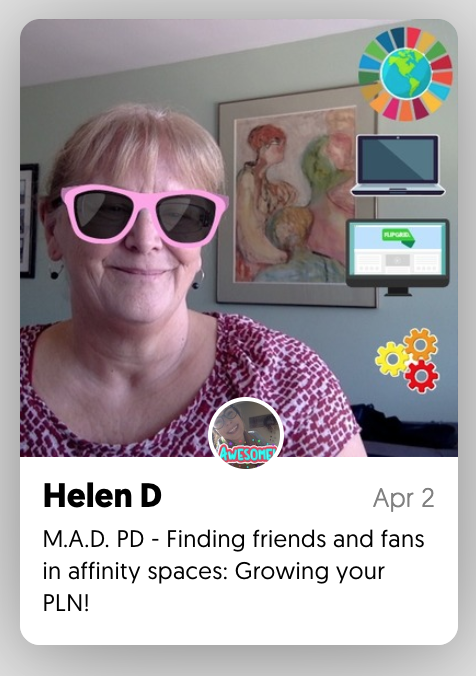 Here’s the one I created for my presentation – Finding Friends and Fans in Affinity Spaces. It was fun to be able to provide feedback to others on their Flipgrid promo videos as a way of communicating interest in their presentations. The video also provided a space to insert a link to the YouTube video for the presentation, since each session was projected and recorded using YouTube live events. I’ve also created a Flipgrid as a means of communicating a response for an online book study that I’ve organized for the ISTE Inclusive Learning Network. For this purpose, it allowed participant to see and hear each other and thereby feel a greater connection to the diverse group reading the book UDL in the Cloud by Katie Novak and Tom Thibodeau. Overall, I see some incredible potential for Flipgrid for both face-2-face learning moments and online courses as discrete learning tasks. I’m thinking this may be a great way to get students to introduce themselves to each other, then ask each student to watch these intro videos and comment on two of them. Or potentially as an alternative to text based discussion forum submissions. They could craft their response, then record the response using the Flipgrid video tool. Since Flipgrid can be used with privacy settings, this could be done without full, open access until students become more familiar with the technology and when they are willing to ‘go open’. Worth a look. It’s time to FLIP for Flipgrid.